​​​​​​U.S. – It’s easy to think that big-box, big-name retailers are going extinct. Shoppers are flocking to Amazon and other online retailers to buy everything from furniture to computers to suits. And the headlines are filled with big-name retailers such as Macy’s, Sears and J.C. Penney announcing their latest round of closures. But a new report, Beyond the Headlines, from CBRE says that the outlook isn’t so glum for all big-box retailers. In this series, CBRE Research​ compares the prevailing headlines with what is actually taking place in the retail real estate industry through a close examination of market fundamentals and retailer activity. 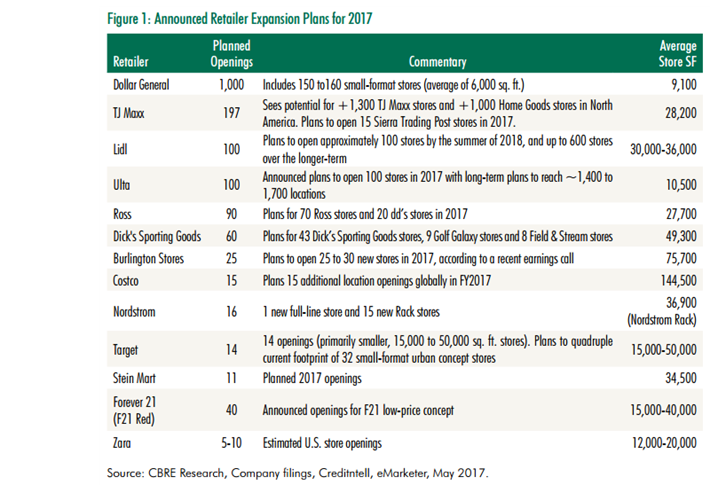 CBRE’s report, released May 18, 2017, says that big-box retailers are on schedule to open hundreds of new stores spanning tens of millions of square feet this year.